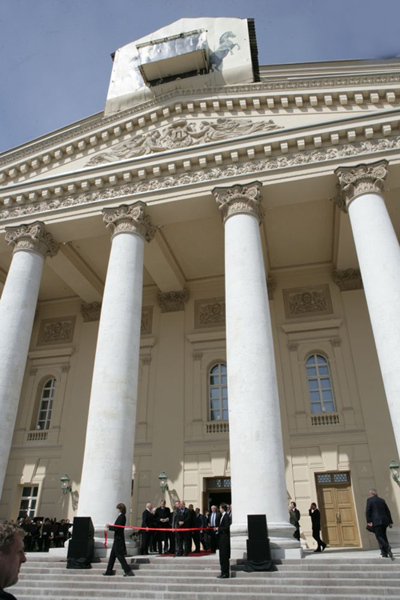 Historic building of the Bolshoi Theatre is closed for renovation between July 2, 2005 and October, 2011. The exterior of the building will remain nearly the same. The extensions along the Northern Facade that were previously used as scenery storage will be removed. The storage will be moved underground to allow for proper restoration of the rear faзade. Number of the best construction companies from Moscow and abroad will take part in the renovation. 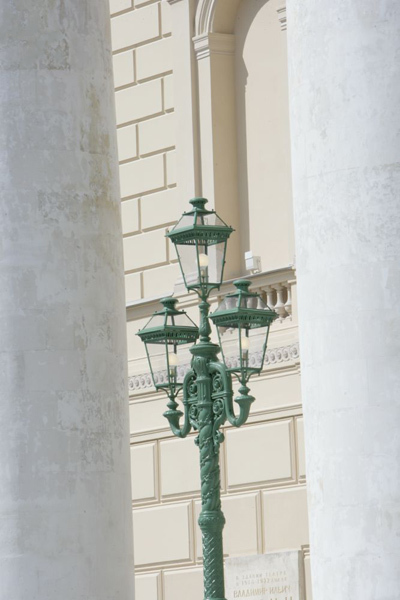 The German company Bosch Rexroth, one of world's leaders in the field, has won the bid to supply the stage equipment for the Bolshoi. Press Conference regarding the renovation of the Bolshoi Theatre took place at the ITAR-TASS News Agency on December 1, 2004. - Renovation means life under extreme conditions. The New Stage will help us to preserve the repertoire and the core of the company. This transfer will require some adjustment to fit our productions on the smaller stage. It means we will need to rebuild some sets and reconsider some of the staging. There are some limitations too. Our large-scale productions, such as Boris Godunov, Spartacus, Daughter of Pharaoh will not fit onto the New Stage. We are now negotiating with the State Kremlin Palace, that used to be Bolshoi second performance venue in the past, and hope to be able to present those productions there. While maintaining our continuous presence in Moscow we will significantly expand our touring - both in Russia and CIS as well as abroad. Our company will be celebrating the 60th anniversary of the V-Day in Samara where Bolshoi was evacuated during the war. This will happen before the closing of our Main Stage. The first city where we will tour after the closing will be Rostov-on-Don. The tour will begin on February 10, 2006. Of Russia's 34 musical theatres only 3 or 4 have big enough stages to accommodate our large-scale productions. We will continue looking for the appropriate venues abroad. Next summer, for instance, we will be presenting Daughter of Pharaoh at the Met. We will be traveling to mid-size Russian theatres as well. This kind of touring is rather expensive. Such tours will be financially a pure loss for the Bolshoi - unless we will be able to receive support from the local and federal governments. Fortunately, this is already the case in some instances. - Bolshoi has undergone numerous renovations (never at such a grand scale though, ) and each attempted improvement did an irreparable harm to both the national landmark itself and to its acoustics. The treatment of the orchestra pit back in the old days was, let's say, far from delicate. The orchestra pit used to be a wooden platform with a dedicated barrel-like huge hollow space beneath serving as a resonator. The platform, made of elm tree, was accepting the vibration like a giant soundboard. The sound, amplified by the resonator, was streaming from the orchestra to the upper canopy tilted toward the audience. The audience therefore was listening to the amplified music. In 1920s the entire hollow space was filled with concrete. The orchestra platform itself was elevated for 20 cm to level with the adjacent hallway. There was more. Initially the electric lighting instruments were installed in the stage floor. (Nowadays, naturally, they are all located at the rear of the house.) The apron was extended at the expense of the orchestra pit. Originally the orchestra pit was going well under the apron. That is why now we can't accommodate the entire orchestra at the pit, and therefore some operas can't be part of our repertoire - including most of Wagner and some of Richard Strauss. We intend to restore the hollow space and the soundboard and to place it on the elevating platform so that we could raise the pit to the parterre level. It would enable us to present symphony concerts on the Main Stage. The orchestra pit for such occasions will be replaced with the seats for the audience. 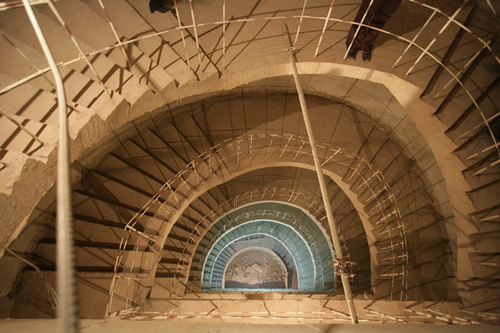 The orchestra will occupy the stage where a special wooden shell will be installed to optimize the acoustics. Technically important is the fact that the orchestra pit platform will also be able to descend to the musical storage level. The loss of acoustics is due not only to the ‘wrongdoing' to the orchestra pit. It is known, for example, that the chorus has difficulty hearing the orchestra. When hanging the fire curtain they have installed brick construction border (it is covered with the cloth and therefore is not visible.) The brick wall has obstructed the sound. Sound from the stage does not reach the canopy over the orchestra pit while the reflection of orchestra sound also can't reach the stage via that canopy. We have to use the monitors to transmit the orchestra sound onto stage. Both the soloists and the chorus are forced to move down the stage. It is because the audience will not hear them should they sing upstage. 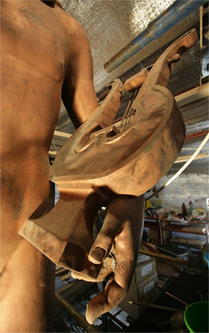 The apron, needless to say, has to become acoustically transparent. The ceiling above the audience used to be wooden. It was also functioning as the soundboard. It was hanging ceiling, it was vibrating while perceiving and reflecting the sound. The sound was distributed evenly to the parterre and all the galleries. They have tightened the soundboard to the framework. This is almost like muting a violin. They treated the floor of the house the same way. Originally the floor was flexible. They used to have balls receptions in the theatre, and the floor used to tilt from flat for danced to angled for watching the theatre. The wooden floor was based on eight legs; it was perceiving and resonating the sound serving as the integral part of the acoustic system. Nowadays the floor is also tight to the concrete foundation. I am not trying to accuse anybody in barbarism. There were numerous emergencies in the building, and emergencies had to be treated accordingly, and I guess there was insufficient awareness of the acoustics back then. The theatre has suffered a lot when they started replacing wooden structures with the concrete ones. This was driven purely by good intentions. They came to realize the scale of the damage only much later when certain things were literally in concrete. I am not saying that Bolshoi now has absolutely no acoustic features. In preparation for the renovation we have conducted a series of research in the audience, and it is proven that there are plenty of spots with excellent acoustics. We have conducted some very thorough acoustic research with the participation of several Russian and Western companies. Among our engineering contractors is Mьller BBM from Germany, one of the best in the West. Their assignment is to ensure complete acoustic rehabilitation of the Bolshoi. Theatre is not their only field, but their theatre experience is more than solid. This company tuned the acoustics in most of the best German theatres as well. They worked at the Bayerisch Opera. In Bayreuth they conduct special testing and issue their recommendations prior to every performance. They worked in France a lot, in Zurich Opera, in America, Korea, Japan, participated in the renovation of Teatro La Fenice in Venice. Their only competitor in the world is American company called Artex, and most likely we will seek their help as well. As soon as our New Stage was opened we were reprimanded of its acoustic imperfections - and unjustly so, I think. The mishaps that there are, can be repaired. The acoustics in our new theatre can be tuned up - just the way they do it in other theatres. Even hanging the wall curtains in proper locations, considering the acoustic absorption ratio, could change things for the better. The height of orchestra pit against the parterre level can be altered at the New Stage. We have long tried various levels until the position optimal sound has been found. A few more specific steps, and I believe the acoustics at the New Stage will finally improve. We will also need to discover how the sound there corresponds to the sound on the Main Stage. There are productions that we perform in both theatres. The orchestra doesn't have to learn two different ways of playing the same music; otherwise what sounds well here may turn into fiasco there. We will need to equate the acoustics of both theatres. A few more words should be said about the stage floor in our theatres. For the first time in Russia the surface we use for opera and ballet will be different. Opera floor will be different from ballet floor. Modern set tends to be very heavy, movable and composite. The floor therefore is subjected to a major weight burden, and subsequently gets warped. While this is less crucial for the opera performances, the potential damage for ballet dancers can be truly devastating, including the loss of professional abilities. This is why we have decided to create a special floor surface for ballet performances at the Bolshoi. It has been ‘tried' at the New Stage, but there it only covers a part of the surface. For the Main Stage we will cover the entire surface with this new floor. The distinct feature of the new surface will also be its acoustic quality: as the ballet dancers require not only flat but also sound-absorbent surface for their performances. The floor for opera performances will have to naturally reflect the sound.